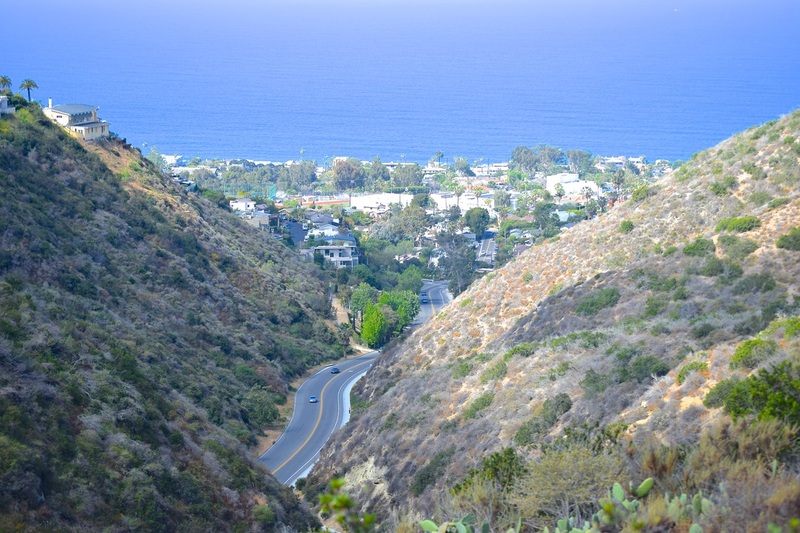 Are you planning on visiting Laguna Beach and like to be active while you see some historic architecture, local landmarks, scenic ocean views, coastal blooms, canyon caves and unique hilltop homes? 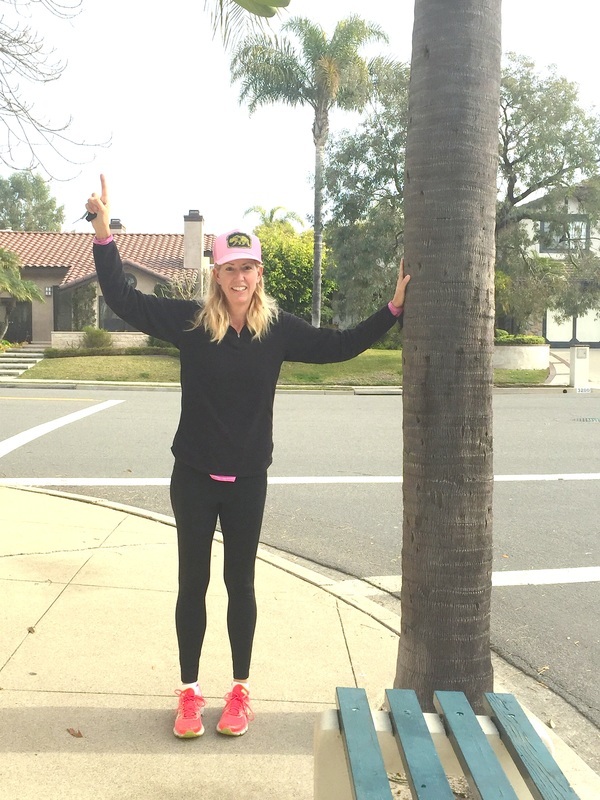 This Fitness Walk is a serious workout with a few stairs and steep hills, all while on a sidewalk experiencing this seaside community. The map for this walk is located at the bottom of this page. The walk is 4.5 miles round trip and will take you 1 1/2 hours if you walk fast. Parking has always been an issue in our small seaside community. ​I strongly suggest parking in a lot instead of a metered space. 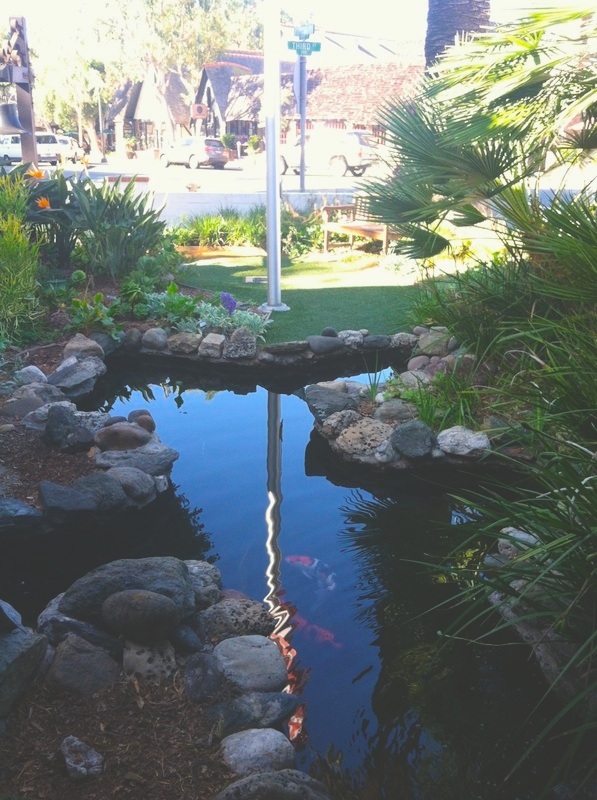 Then you have all day to explore Laguna Beach without worrying if your time has expired. 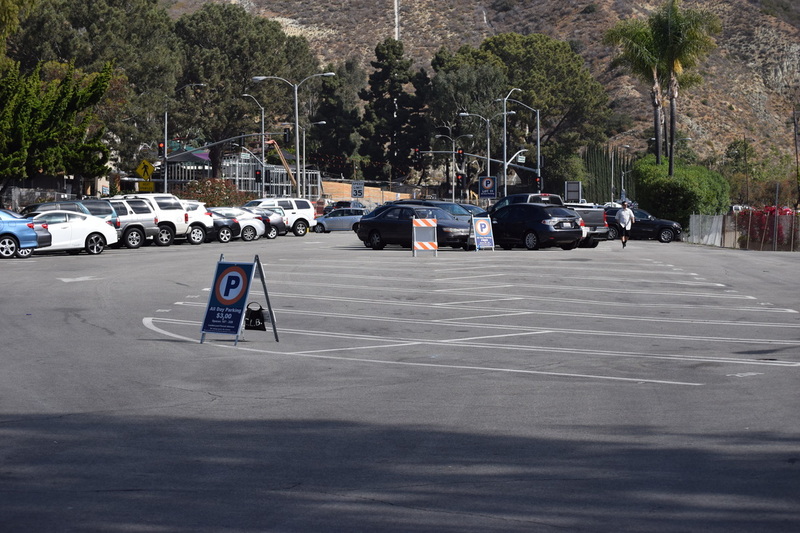 This lot is located at 551 Forest Avenue and has 161 regular spaces, 4 handicap spaces and 2 electric charging stations. Acceptable payments include credit cards or dollar bills. 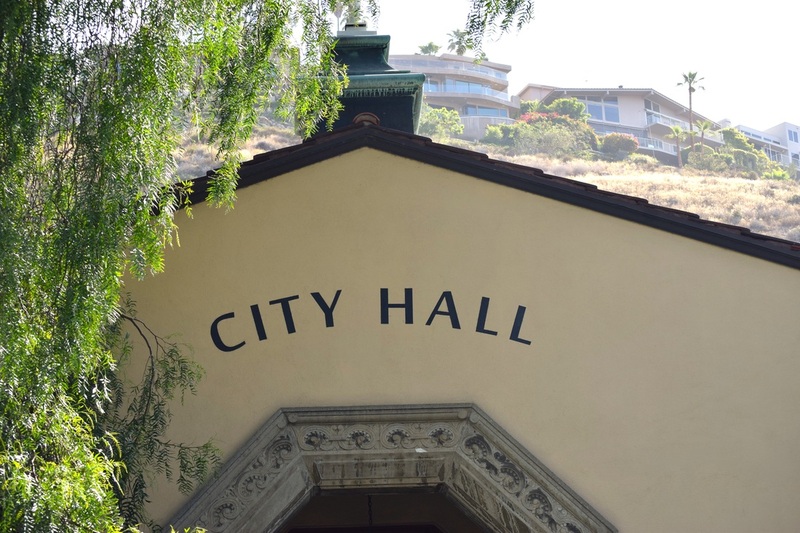 This Spanish Colonial Revival building is where the City Council meets, along with our famous Design Review Committee. They are in charge of proposed development projects. One rule they strictly enforce is our 36 foot height limit for all buildings. In contrast, Waikiki and Miami Beach have structures as tall as 100 feet. This tree, in front of City Hall, was planted in the late 1800s and is our "Christmas Tree". 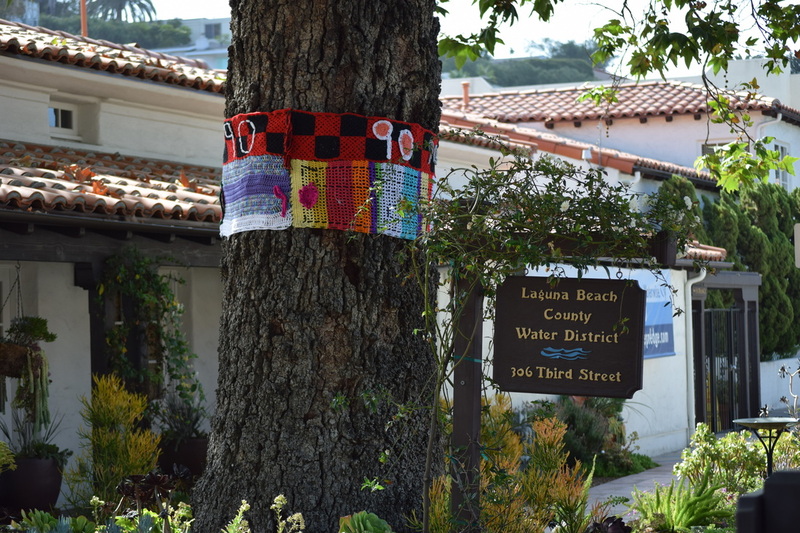 The first Friday of December the city of Laguna Beach closes down Forest Avenue and Santa comes to light up this tree for the holidays. This piece features three figures, representing every man, woman, and child. 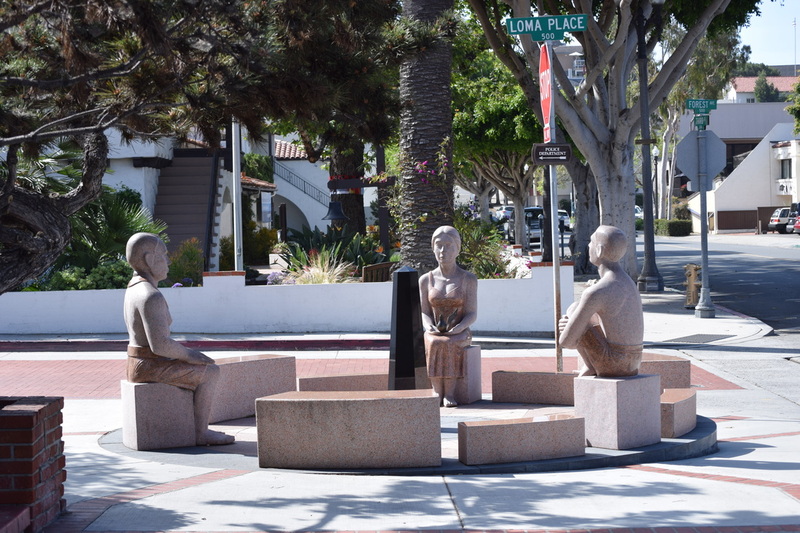 They are sitting around a black obelisk that serves as a sundial highlighting words on the ground representing aspirations of the community. 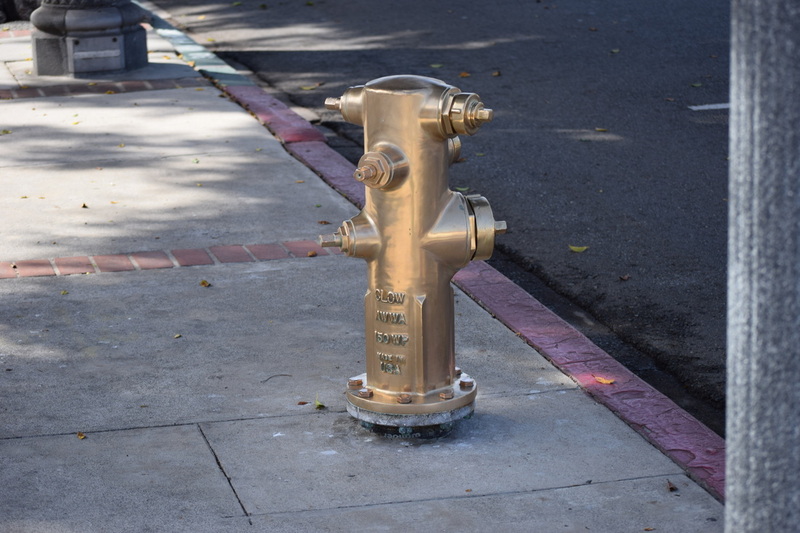 This working fire hydrant is in front of the Laguna Beach Water District and is shined every morning. 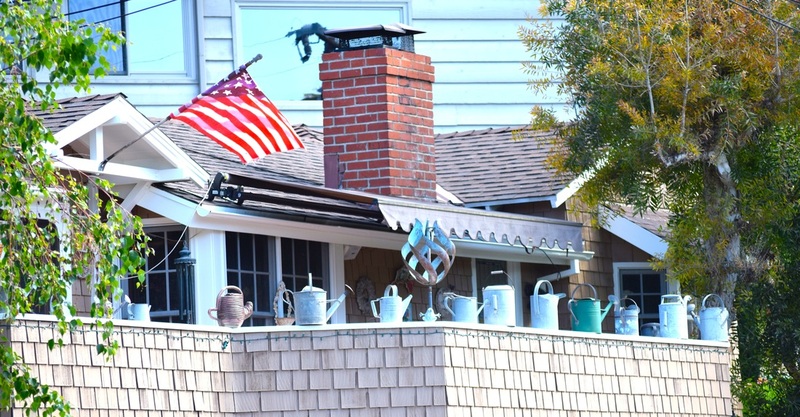 The Laguna Beach Water District's website says their mission is to "provide reliable, safe, and prudently-managed retail water service to our customers". 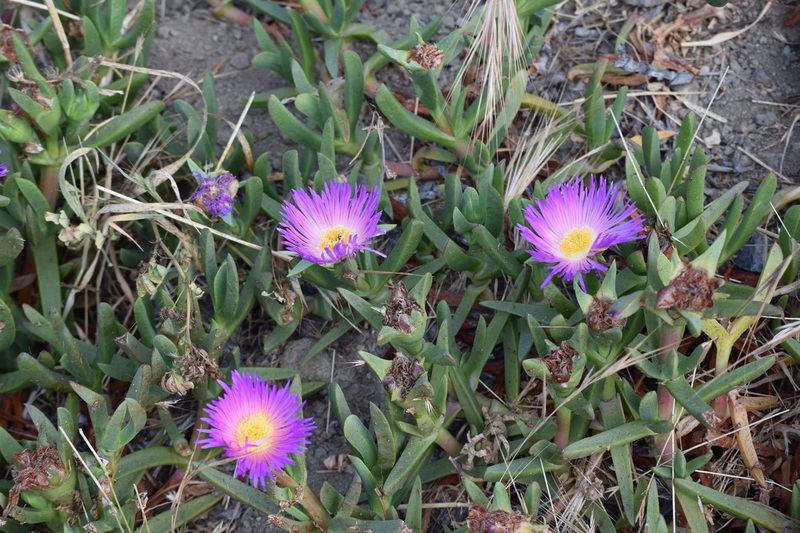 They operate and maintain an absolutely beautiful garden showcasing coastal blooms, native to this area, requiring little water. They have coloring books for the kids to teach them water conservation along with information for adults on programs and rebates for water-wise consumption. 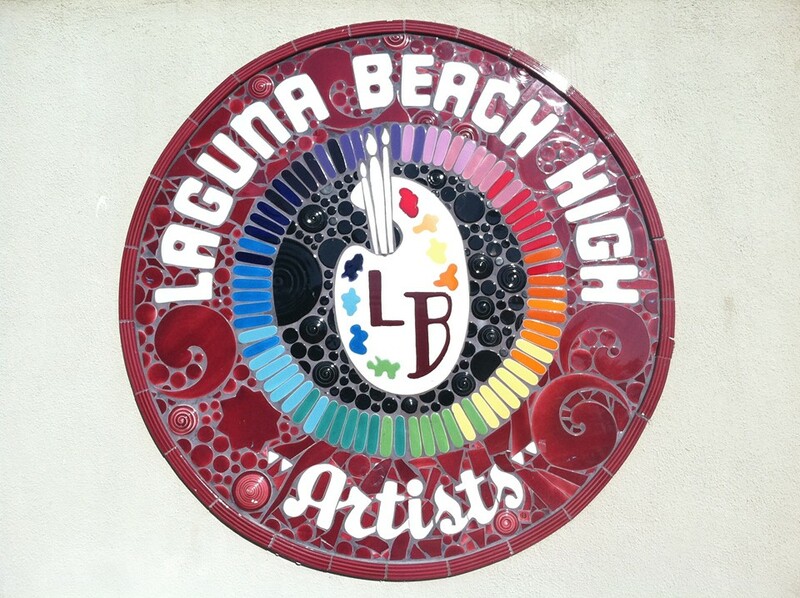 This wall relief by local artist, Mike Tauber, is across the street from the Susi Q Senior Center. In 2007 when this was completed, there were 50,000 new US cases of HIV. 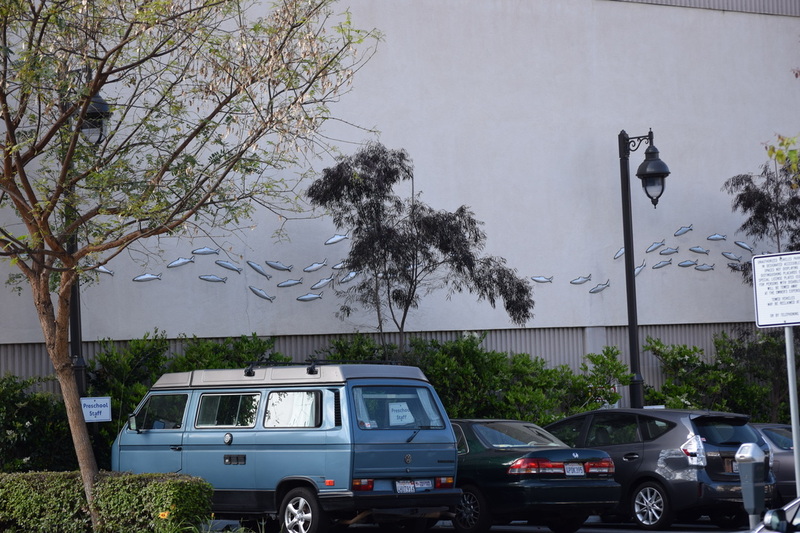 Each fish on this wall represents 1000 of those cases. On World AIDS Day (today), watch the lead fish. If he is pointing up, numbers are rising. If he is pointing down, our "Community" (the name of this piece), is making progress. 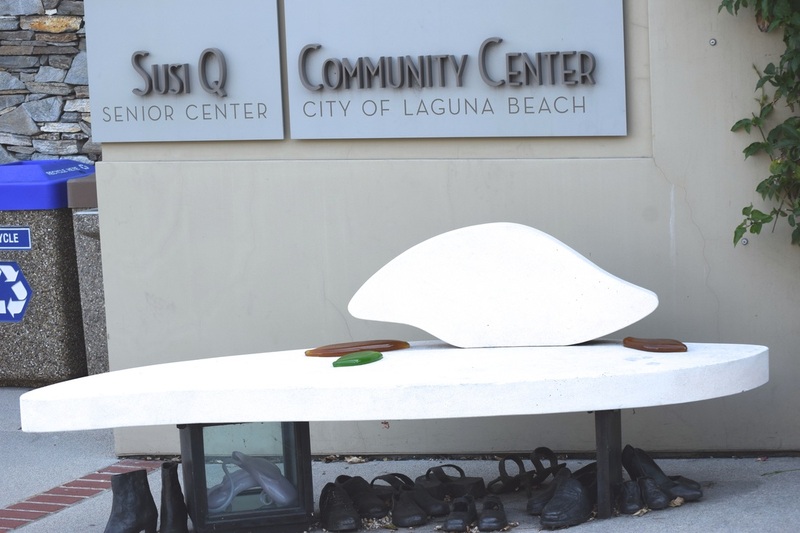 This limestone bench includes glass and bronze shoes that represent the inter-generaltional and recreational uses of the Susi Q Community Center. The mission of this senior center is, "To work together to enhance the lives of seniors through programs, services, and advocacy that promote independence, wellness and community". 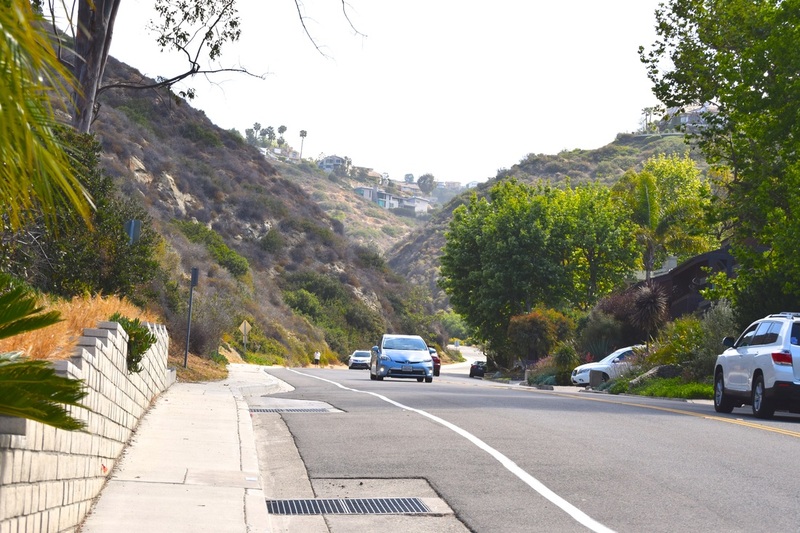 This hill is reportedly the steepest street in Orange County and one of the top 10 steepest in the country, according to RoadBikeReview.com. Stay on the stairs to the left of the road. Once you reach the top of the hill, turn left on Park Avenue. 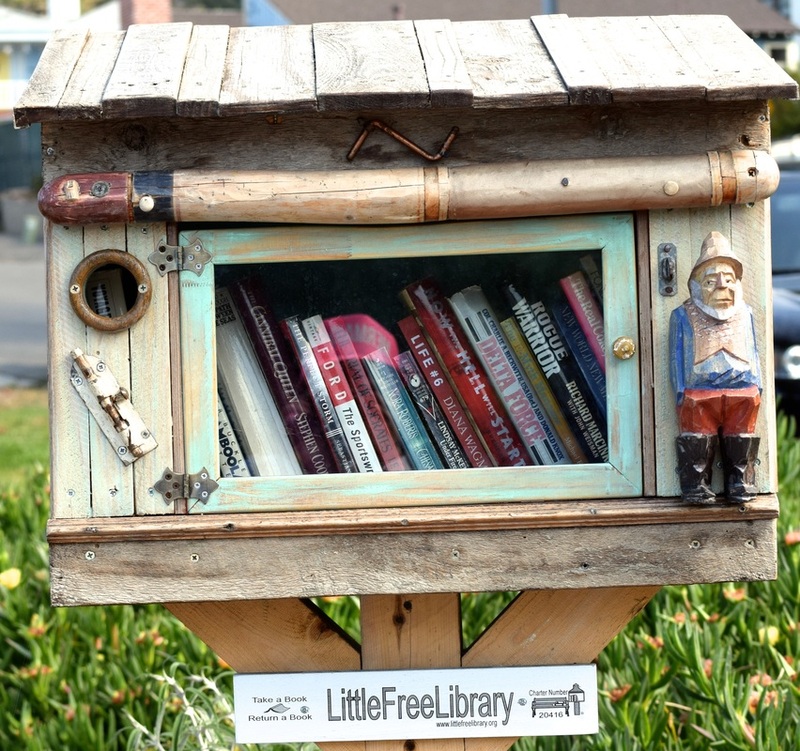 Many homeowners in Laguna Beach have constructed 'Little Free Libraries'. They are to promote literacy and the love of reading, while building a sense of community. This is a free book exchange, so if you have any books you would like to donate, please do so. For more information on these libraries, go to www.littlefreelibrary.org. William Wendt was a California Impressionist painter who moved to Laguna Beach in the early 1900s. He was given the name, 'the dean of Southern California artists' and was the first president of the California Art Club. In April of 2015, William Wendt's, "The Old Coast Road," circa 1916, sold at auction for $1,565,000. Are you ready to elevate your heart rate? 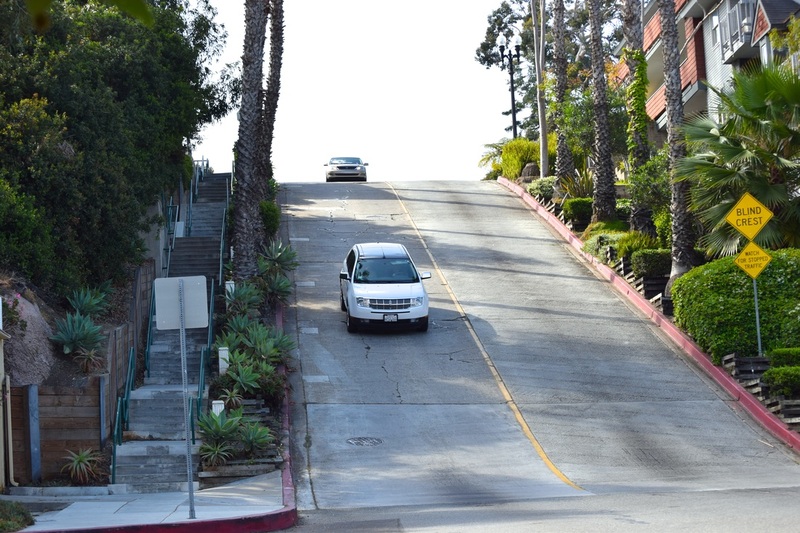 Start charging up this hill and you will get in a fabulous workout. Please stay on the sidewalk because sometimes the cars think they are in a Nascar race driving too fast and they don't always stay inside the lanes. 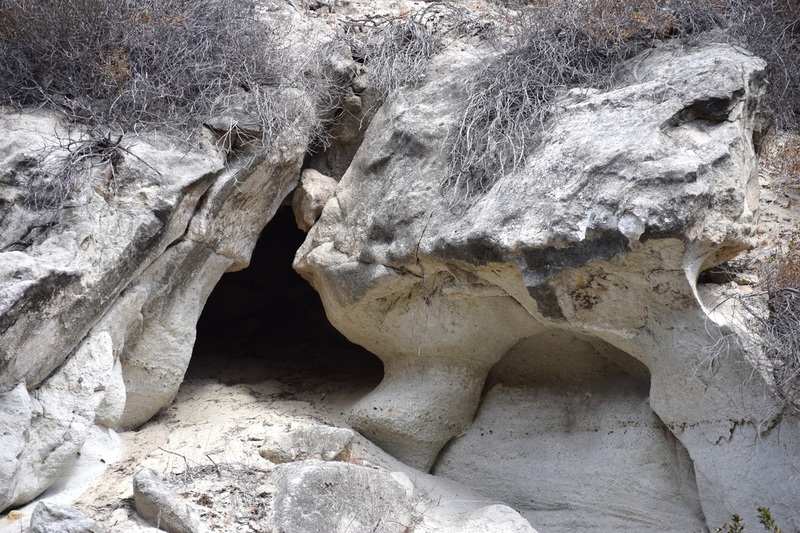 Lots of different cave formations can be seen while walking up Park Avenue. Beware of coyotes and critters living inside. 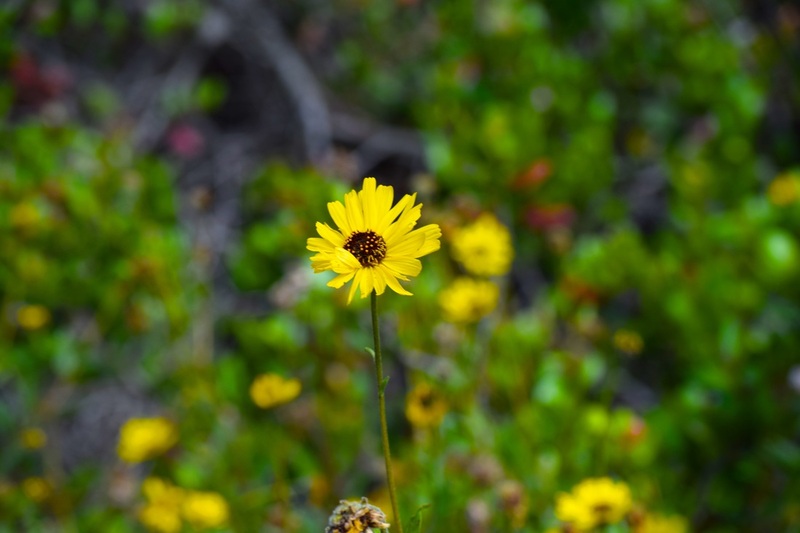 During various times of the year, wildflowers bloom all along Park Avenue. 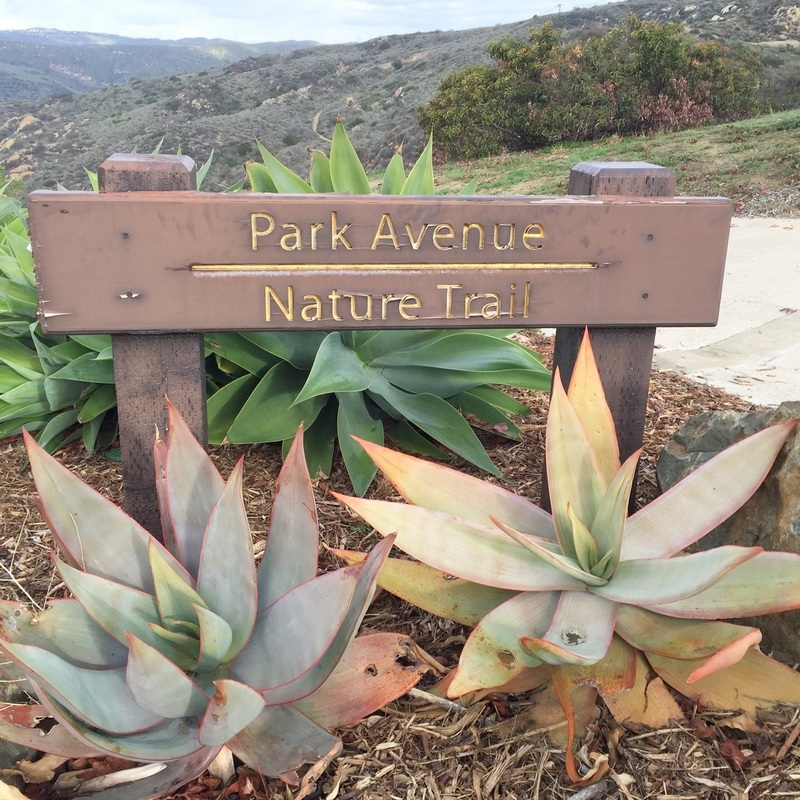 If you want to learn more about the flora and fauna that reside here, go to the Nix Nature Center at 18751 Laguna Canyon Road. 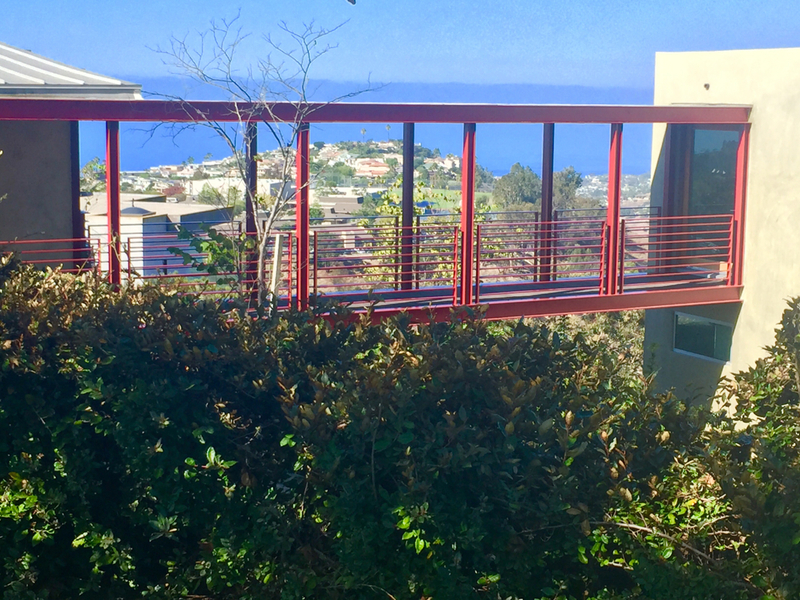 Your hard work is paying off with views of the Pacific Ocean and unique hillside homes. You have just power walked 1.5 miles with 0.5 miles to go until you reach the top. Keep going! 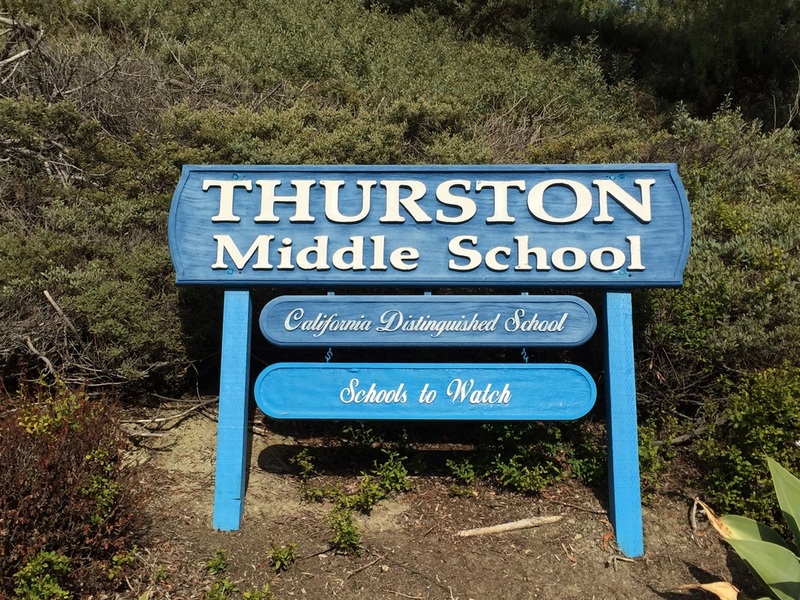 This public middle school was named after the first family who settled and stayed in Laguna Beach in 1871. 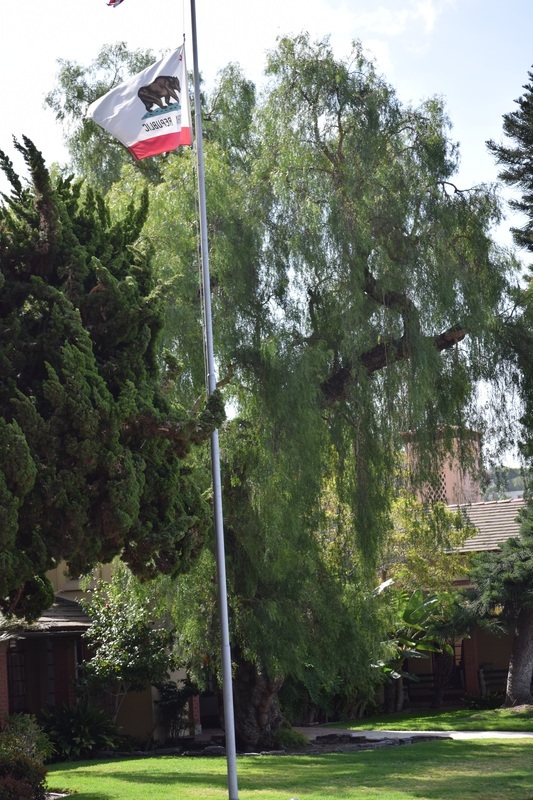 The mascot is the Wave Rider and it was recognized as a California Distinguished School in 2014. One of the most prominent modern architects in town is Horst Noppenberger. 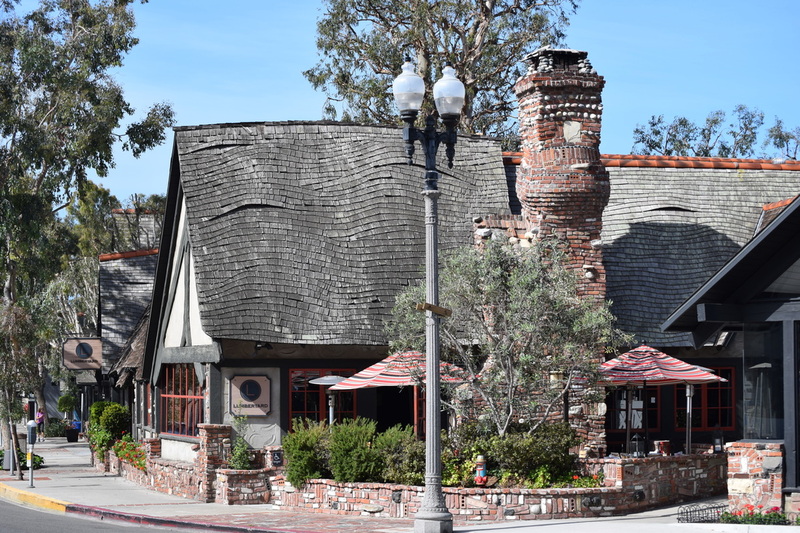 Two of my favorite buildings he did in town was Hotel Seven4One and the Obagi Skin Care building, both on PCH. The Hotel has a "Living Wall" gracing the front and the Obagi building has a large curved stone wall that emulates the shape of a human body. 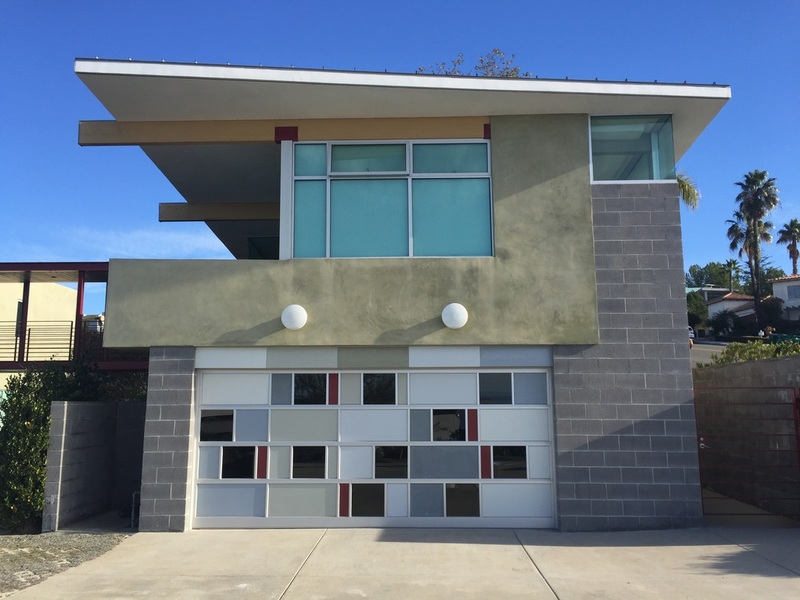 Laguna Beach has a fun architecture club in town called, "Laguna Friends of Architecture". They usually meet once a month and have speakers and home tours. 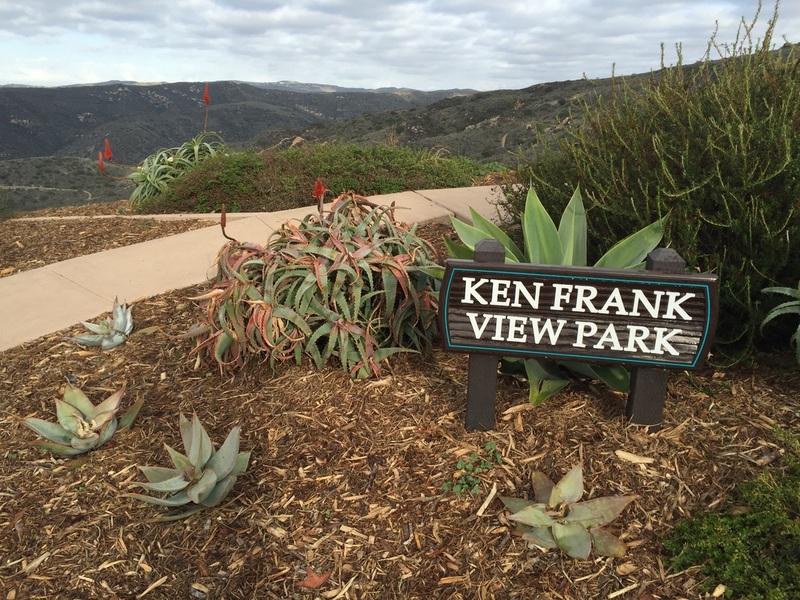 This small park was created in 2012 and named the Ken Frank View Park by the City Council to honor the retired city manager who served the city for 31 years. 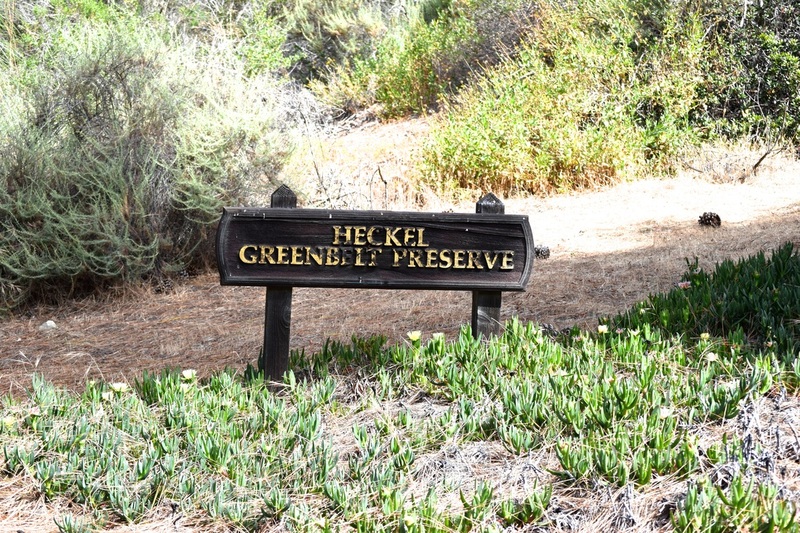 Ken was an advocate for open-space preservation and spent $40-$50 million of the city's money to buy thousands of acres of open space in Laguna Canyon. 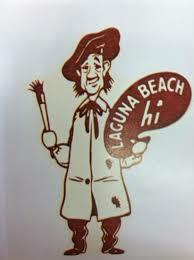 He is also credited for creating amenities at Moulton Meadows, Lang, Alta Laguna, Treasure Island and Arch Beach Heights View parks. 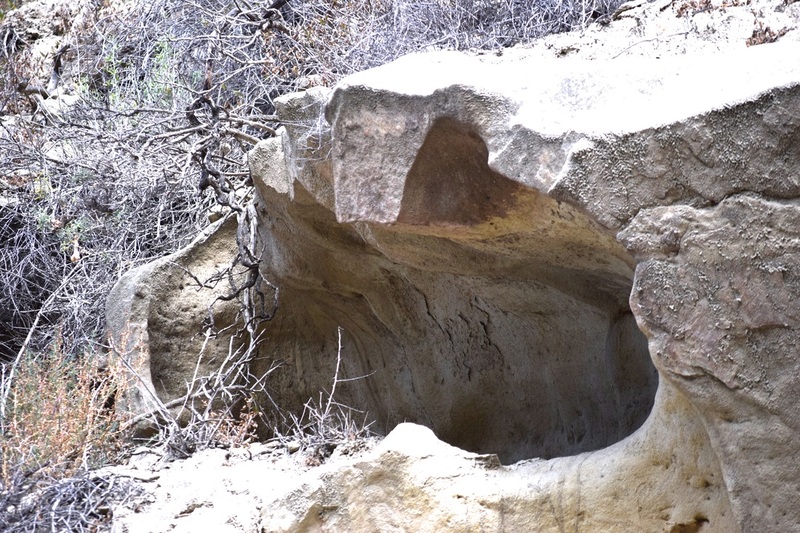 This hiking trail is part of the Aliso & Wood Canyons Wilderness Park. 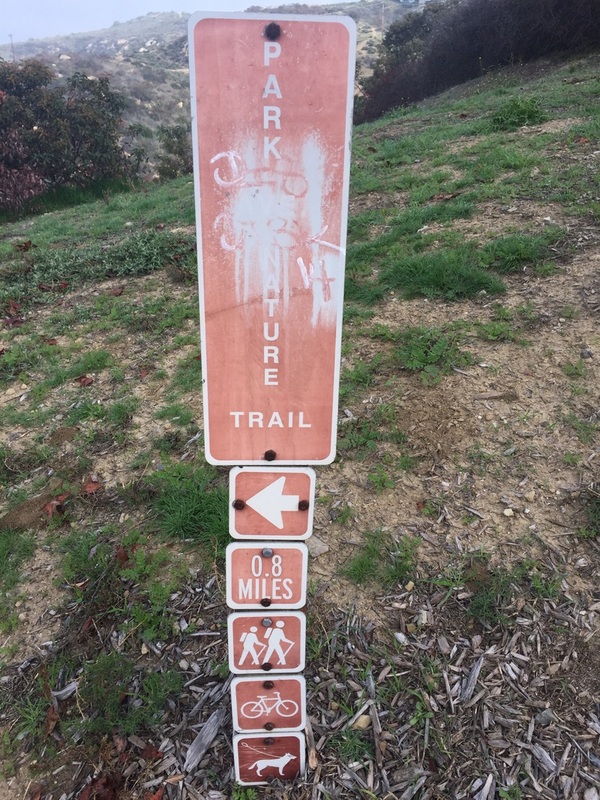 The trailhead starts at Alta Laguna Park and it is approximately 0.8 miles long. Congratulations! 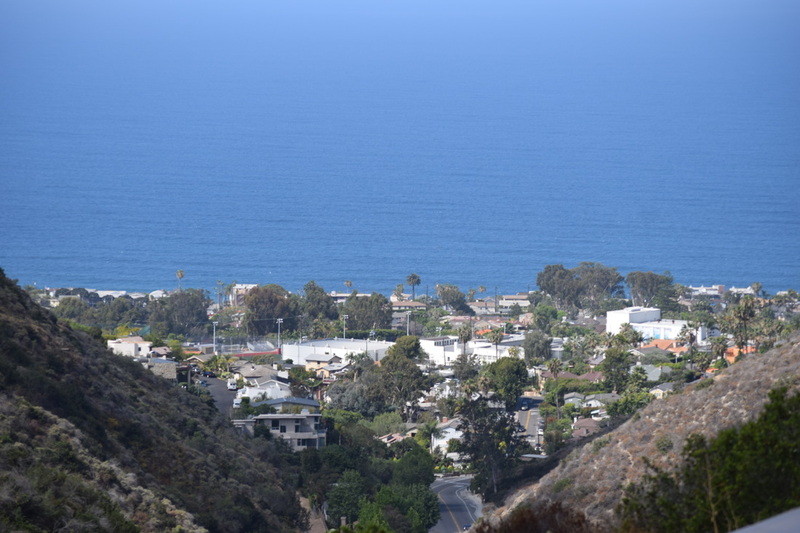 You have reached the the top of Park Avenue and the area of Laguna called, "Top of the World". 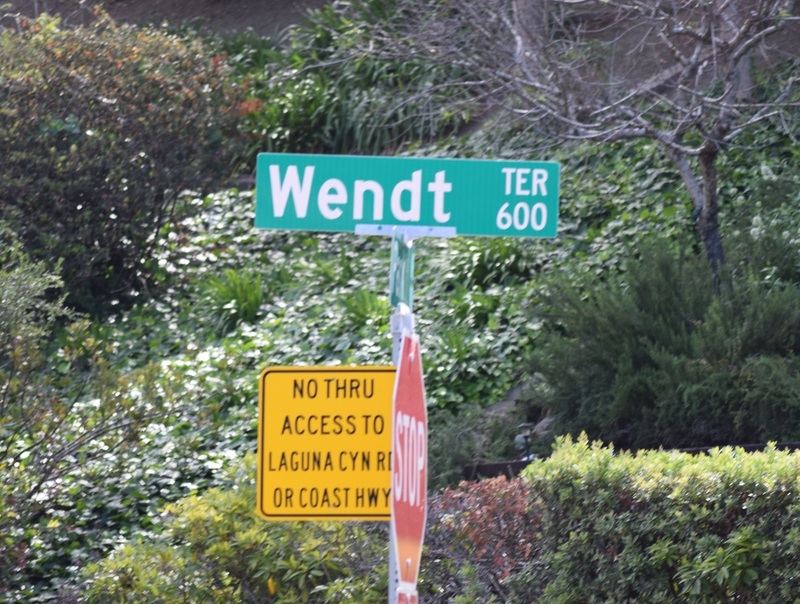 This is the corner of Alta Laguna and Park Avenue. You have to touch this tree or your walk doesn't count! Now you can walk down the way you came. Going the opposite direction, you will notice many more things that you didn't see coming up. Look for the purple house on the ridge. Look for the bocci ball court the Hidden Hills community built.